One pot pasta dinners having been taking over Pinterest lately and to be honest I can understand why. 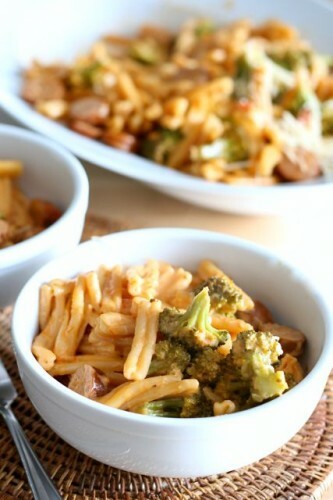 Less dishes, dinner ready in thirty minutes, and using ingredients without funky preservatives all major plusses. One pot dinners aren’t anything new. In fact while in college I ate my fair share of one pot dinners without giving it much thought. Hamburger Helper, anyone? Actually for me it was Hy-Vee brand Panburger Partner because it was cheaper i.e more beer money. This type of dinner has come in so handy this summer and I don’t predict the one pot dinner trend going away any time soon. To be perfectly honest I just made a one pot Mexican rice dinner last night using leftover pulled pork. Mmm hmm. I think I will have to recreate it to share with you. Are you jumping on the one pot bandwagon? What does a quick dinner look like in your house? Soccer starts tomorrow, school starts at the end of the month, ballet, and PTA activities will start next month, so I know I will be on the hunt for dinners that I can get on the table quickly and ones that will have minimal clean up. 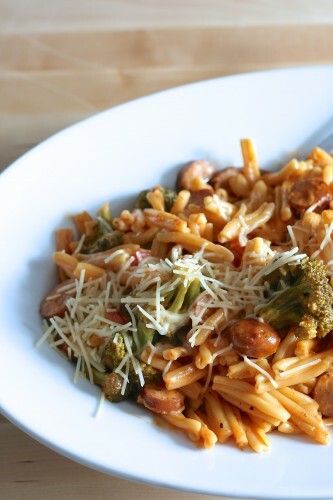 Precooked chicken sausage helped to make this dinner more filling. I also tossed in some broccoli since it needed to be used up and I wanted my children to get more veggies, a total Mom move I know. The pasta is cooked in the pot with the chicken sausage, chicken stock, and pasta sauce. When it is ready to serve I stirred in a little cream to create a luscious creamy tomato sauce. Top with a sprinkle of Parmesan cheese and serve with a side salad and you have yourself a winning dinner. My husband said he could see this pasta dish on a restaurant menu. What better endorsement can you get than that?! On an unrelated note: Â We are watching the TV series Fargo right now –so good but once that is over we will need a new series to watch. What do you recommend? Turn heat up to medium high. Add pasta, 3 cups chicken stock, and pasta sauce and stir. Bring mixture up to a boil. Cover and turn down heat to medium -low. Simmer for 10 minutes. Stir in broccoli. If most of the liquid has evaporated add in 1/4 cup - 1/2 cup chicken stock. Cover. Simmer for 5 more minutes. Remove from heat. Stir in 1/2 cup cream or half & half. Garnish with Parmesan cheese before serving. Loving his creamy one pot wonderful dish you created! These are totally the types of recipes that we can’t get enough of! I love one pot meals. This one looks terrific. 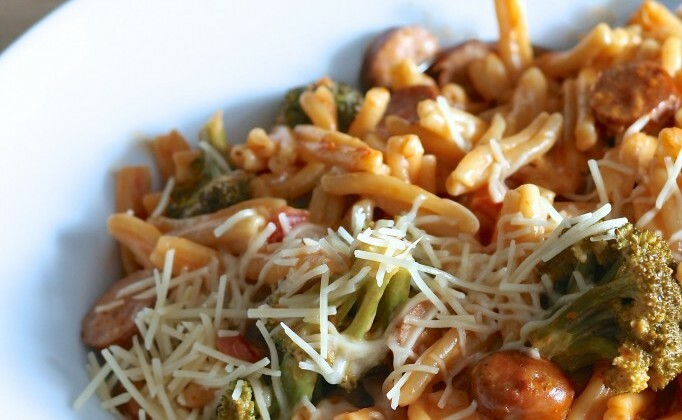 One pot meals are SOOOOO awesome now that I have a little toddler underfoot. Can’t wait to try this!